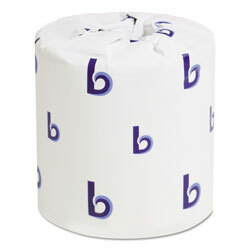 This bulk toilet paper is perfect for stocking public or office restrooms. Even though you're buying the product as wholesale toilet paper, each roll comes individually wrapped. This makes the product the perfect solution for stocking washrooms with individual storage for toilet paper. At ReStockIt.com, we make sure that people can tell what they're paying for when they decide to buy bulk toilet paper. That is why the products which qualify as being recycled or environmentally friendly, are marked with our 'green product' guarantee, like this great toilet paper from Boardwalk. If you're stocking busy washrooms, you know how fast you can burn through toilet paper. Don't let this consumable cost become a burden on your books. Instead, use the wholesale toilet paper options at ReStockIt.com to keep your bathroom shelves stocked affordably. Get the same great quality toilet tissue that you would buy retail at the best wholesale prices. INNER PACKAGING: 96 Rolls Per Case. Sheet Size (L x W): 4" x 3"
White Regular Roll Toilet Paper from Boardwalk! 17954 In Stock today. We buy for the government buildings and it's the best product for the price. We have to be good stewards of the public's money and still provide a good service. This product helps us to do just that. It gives the softness of 2 ply at the cost of single ply sheets. This is a good product for the price equal value to other economical brands. Its 2ply and soft and comes packaged 96 rolls to the box. Rolls are standard sized and work great in our jail. Good quality toilet paper you won't be embarrassed to use in your home. It's cheap but it doesn't feel like cheap toilet paper. Terrific value. I love this paper! Great value, good quality and arrives right to my front door. No more taking up my entire shopping cart. We all use the product the same way. Thank you for the free shipping. The ordered items are good value and I am satisfied. We use this product in our restrooms. We have always bought this brand for our company but it seems that the 2 ply feels more like a 1 ply. Seems like they changed it down the line. Good value and product for our preschool. This is a new purchase for our production facility. For some reason, these are 1/2" smaller than the other brand we were currently using, making the TP fall out of the holders. It also states that there are 500 sheets per roll, but when comparing them to the other ones we were purchasing, they're noticeably smaller. I will not buy this again.